The high ratings and preventative aspect of this product make it a winner. With up to 28 days of flea growth inhibitors, this is an excellent alternative to monthly treatments. 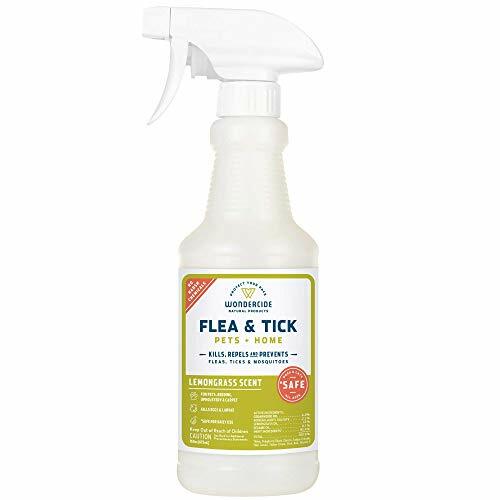 If you need rapid treatment on your pet, this spray kills fleas and ticks on the spot. You may think of fleas and ticks and a nuisance but not a serious enough problem to worry about. However, fleas and ticks pose serious health risks such as Lyme disease, various fevers, and even plague to both you and your pet. Once a flea infestation invades your home, it can be a daunting task to remove them and often requires harsh chemicals. Rather than dealing with ectoparasites in your carpet or risking contracting illnesses such as Rocky Mountain Spotted Fever, we’ve rounded up the best flea and tick prevention products for your beloved pet. Kills fleas in every stage, from eggs to adults. Kills fleas through contact, they don’t have to bite to ingest poison. Begins to work within 12 hours. Effective for a full month. Does not work on ticks. Ineffective for some dog owners, and in rare situations dogs will have an adverse reaction. Treats both fleas and lice, as well as preventing infestations. Do not use on puppies less than seven weeks old. Available in a four-month and six-month doses. Dosages come in sizes for dogs as small as three pounds, up to over 55 pounds. Active ingredients: Imidacloprid (9.10 percent) and Pyriproxyfen (.46 percent). 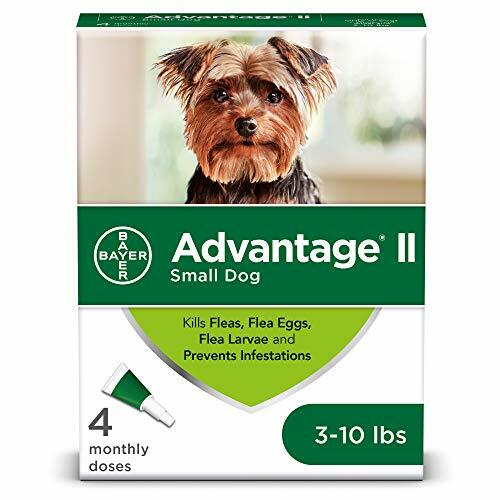 The Advantage II Topical Flea Treatment is an easy-to-use mini tube that you apply on the skin of your canine between their shoulders at the base of their neck. It comes in sizes for dogs 3-10 pounds, 11-20 pounds, 21-55 pounds, and over 55 pounds. This monthly treatment also kills lice, which is a nice bonus. However, this does not kill ticks. If fleas are your biggest concern and ticks are not an issue where you live, this is an excellent all-around flea treatment and prevention. Long-lasting flea prevention in a wash for dog’s entire body. No harsh monthly treatment on one skin spot. Can also be used on cats. Kills fleas, larvae, lice, and ticks. Long shelf life in bottle. Entire body treatment that kills fleas during the wash and prevents further infestation. Some pets have adverse reactions. May require multiple washes to eradicate fleas completely. Spot test on your animal before washing your pet’s entire body. Twelve ounces in a bottle. Can be used on kittens and puppies 12 weeks and older. Contains soothing ingredients for skin such as oatmeal and aloe. Active ingredients: Pyrethrins (.75 percent), Piperonyl Butoxide (.75 percent), and Pyriproxyfen (.86 percent). 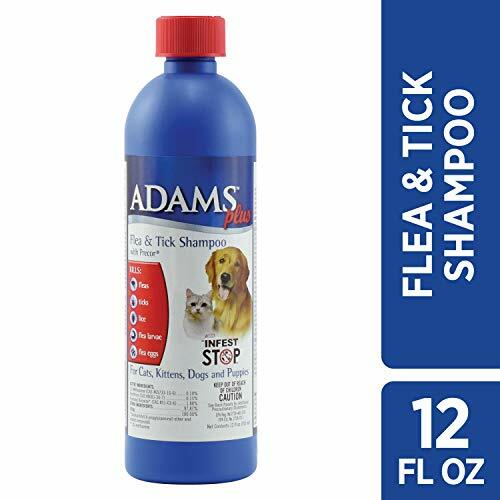 Adams Plus Flea and Tick Shampoo with Precor is a concentrated shampoo with a thick lather that is infused with coconut extract, oatmeal for itch, lanolin, and aloe to soothe skin. This flea shampoo gives your dog’s coat a soft feel and beautiful shine. The shampoo removes flaking dandruff and soil. PRECOR is an insect growth regulator that provides up to 28-day-control of pre-adult fleas. It kills fleas before they grow into biting, potentially disease-spreading adult ectoparasites. It’s best to spot test this on your pet before entirely bathing them in the shampoo. Break flea life-cycle up to two months with proper use. Reasonably affordable for use on smaller animals (more needs used on larger dogs). Can be sprayed onto fur and lightly massaged onto your pet. Some animals, especially smaller ones, have adverse reactions. Active ingredients: Etofenprox (.50 percent), S-Methoprene (.27 percent), and Piperonyl Butoxide (1.75 percent). 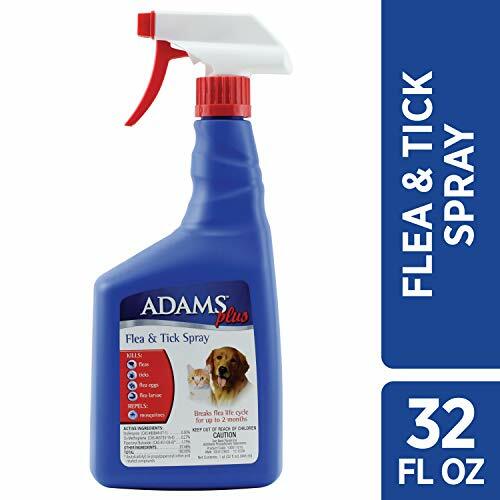 Adams Plus Flea and Tick Spray destroys adult fleas, their eggs, larvae, as well as ticks. This spray also repels mosquitoes. If flea eggs and larvae are sprayed with Adams Plus Spray, they will not grow into biting adults. This flea and tick spray blends the adult flea killing ingredient of etofenprox with the long-lasting egg-eradicating ingredient of S-Methoprene Insect Growth Regulator. This combination of flea treatments delivers rapid relief from both biting fleas and ongoing destruction of eggs, breaking the flea life cycle. Kills not just fleas, but also ticks and lice. Can be rubbed into fur or dusted on pet bedding. Shaker top makes application easy. No wet spray to deal with. Can be used on cats, too. Yard control of flea-infested areas. Some animals have severe adverse reactions. Occasionally customers found it ineffective. Cannot get into water sources, as stated on the label. Spot test on your animal before coating their fur. Not for use on your pet’s face area. Can also be used outside for flea-infested areas of your yard. For application on cats and dogs six months and older. Active ingredients: Pyrethrins (0.1 percent), Piperonyl Butoxide (1.0 percent). 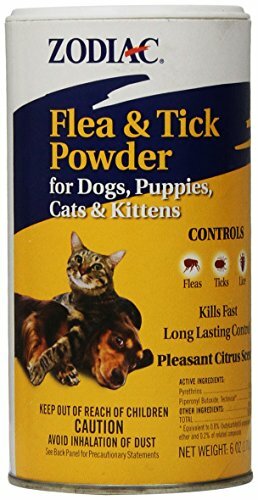 Zodiac Flea and Tick Powder for Dogs, Puppies, Cats, and Kittens is not only an excellent powder for use dusting pet bedding or rugs infested with fleas, but it can also be used in your lawn areas where these pests are most likely to live. Pets often rest in protected, shady areas outdoors, and those are the same places those tiny insects like to infest when outside. If you can’t stand sprays and want a flea treatment that you can spot test, unlike potent once-a-month products, this is a fantastic option. This powder also kills lice infestations and ticks. No clove oil, pyrethrins, or toxic ingredients. For use on bedding, flooring, upholstery, carpets, and pets. Nearly 60 percent of over 2,000 reviews rated five stars. Kills fleas, ticks, and mosquitos. Made with 100 percent natural ingredients. Kills full flea life cycle, including larvae. Safe around pregnant mothers, kids, and for both cats and dogs. Made in the USA by a woman-owned business. Slightly pricier than some sprays. Some people found it ineffective. Fresh lemongrass essential oil scent. Available in 4-ounce, 16-ounce, 32-ounce, and one-gallon sizes. Can also be used outdoors for flea-infested areas of your yard. Apply to infested pets every two to three days (after spot test). Active ingredients: cedar oil (4.2 percent), natural sodium lauryl sulfate (2.2 percent), lemongrass oil (1.5 percent), sesame oil (0.1 percent). Wondercide Flea and Tick and Mosquito Spray is an excellent all-around product, especially if you’re worried about toxins. This non-staining spray can be used on pet bedding, furniture, carpet, in the yard, in insect hiding spots, and on the fur of both cats and dogs. It’s best to spot test before using this all over your dog or cat’s body. Remember never to spray directly in the face and avoid eyes. Spray in a ventilated area to prevent your pet’s sensitive sense of smell from being overwhelmed by the scent of essential oil. Preventing fleas with sprays, powders, monthly treatments, or preventative shampoos can be far less hassle than dealing with hundreds of insects taking over your home. Imidacloprid is a pesticide that was created to mimic nicotine in insects and disrupts normal nerve functioning, shutting down the nervous system. Pyriproxyfen acts like a hormone in insects and disrupts their growth. It’s an insect growth regulator that affects mostly young insects and the eggs. Pyrethrins are a blend of six chemicals that are highly toxic to insects. They are found naturally in some chrysanthemum flowers. Pyrethroids are a type of man-made pesticides comparable to the natural pesticide pyrethrum or pyrethrins. Piperonyl butoxide is a man-made pesticide that alone does nothing but works with other insecticides to increase their effectiveness. Piperonyl butoxide is nearly non-toxic to humans, birds, and other mammals. However, once it is combined with other pesticides like pyrethrins or pyrethroids is makes a strong insect killer. Cedar oil blocks octopamine, which is needed to regulate heart rate and metabolism in ectoparasites like fleas and ticks. A mosquito study conducted in Thailand found that lemongrass essential oil at 10 percent concentration killed 100 percent of these three types of species of mosquitoes within 24 hours of exposure. Citral is considered the primary component of lemongrass with biological effects on insects. Ticks attach to animals via their mouths. There are several illnesses associated with ticks, not only for your pet but that also pose a threat to you. Most often, ticks carry the illness Lyme disease. Both people and animals can get Lyme disease through bites from ticks. Symptoms most often include fever, excessive fatigue, headaches, and a skin rash. Untreated, Lyme disease may spread to you or your pet’s joints, heart, and nervous system. Especially in specific regions, ticks can be a problem even within your own backyard. Keeping a barrier between your lawn and any forested areas can also help prevent tick infestation on your property. Gravel, a pebble moat, or mulch can be used between woodlands to minimize tick migration. Treating your property with tick-repellant sprays or powders is an extra safety measure. Fleas are wingless insects pose numerous health risks. When bitten, you will often see a small reddened spot encircled by a red halo, typically without much swelling with fleabites. Persistent scratching can result in patches of hair loss or irritated skin. Research shows fleas can spread a typhus disease in humans. If the fleas fed off of infected rodents, in some areas, they even pose the threat of plague. Even in the United States, bubonic plague is a threat, particularly in the west. Some people and pets suffer from allergic dermatitis via fleabites. Allergic Dermatitis is distinguished by acute itching, hair or fur loss, inflamed skin, and sometimes secondary infections. It takes just one tiny flea bite to start an allergic reaction. Itching can last nearly a week after the bite occurred. Once fleas take root in your home, eliminating them requires an intensive program to destroy the infestation. Ridding your house or apartment of fleas necessitates steps that include zealous vacuuming, high-temp washing of clothes and sheets, terminating fleas on pets with various medicines and shampoos, and if needed, treating shaded outdoor places where your pets rest. Preventing fleas with sprays, powders, monthly treatments, or preventative shampoos can be far less hassle than dealing with hundreds of insects taking over your home. Not all methods will work for all pets and pet owners. However, with the listed options here, you’re bound to find something that works for you and your dog—whether it’s monthly prevention or an all-natural, eco-friendly spray.